Do you want to learn more about working with others to grow your own food and organic gardening? Enthusiasm for learning with and from young people from other cultures and countries is essential. 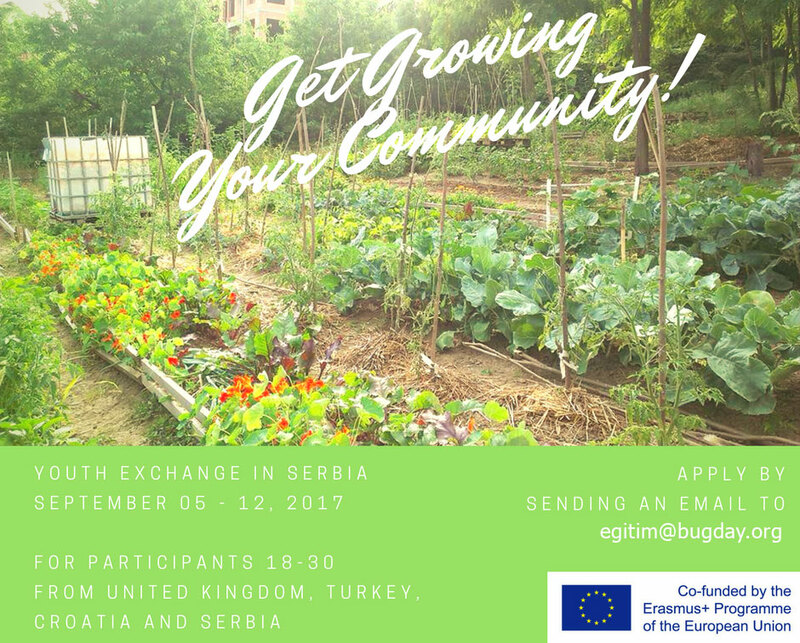 If so you may want to be selected as one of the participants in EU Youth Exchange Project – “Get Growing Your Community from September 5th – 12th 2017. All your travel, accommodation, meals and participation fee will be free to you. Aimed at young people who want to grow plants and food with others as part of community building by volunteering, managing or setting up a community garden, or similar food or farming project. With young people from each of the four partner countries, together with four coordinators/ trainers from each country. We plan to confirm the participants by the end of July, so let us know by Thursday 20th July at the latest. Organised by Amma (Serbia-Katarina), Susted (UK-Adam), Bugday (Turkey-Mehmet), Ekosense (Croatia-AnaMarija) and co-funded by Erasmus+.